The Atomic Energy Commission, shortly after World War II, recommended that a 640 square mile "testing ground" be carved out of the 5,400 square mile gunnery range in use by the military in southern Nevada. The testing of nuclear weapons was considered essential to national security, and President Truman authorized the opening of the Nevada Test Site on December 18, 1950. The first atmospheric test at the new site was conducted at Frenchman's Flat on January 27, 1951. Hanford and White Bluffs, Washington had already been "condemned," paving the way for the construction of facilities manufacturing weapons-grade plutonium. One hundred and nineteen tests were conducted until a moratorium was established from 1958 to 1961. Until the United States and the Soviet Union signed a limited test ban treaty on August 5, 1963, another one hundred and two "devices" were detonated. Since 1963, however, all explosions have been underground. Just as information about the harmful effects of radiation was scarce, the folklore about everything nuclear exploded. Contemporary dances, drinks, and even the "bikini" owe their namesakes to the nuclear age. Although many Nevadans remember driving to the roadside along Highway 95 to watch the blasts, the test site itself was strictly off limits. Rarely have photographers been allowed to document the visual effects of the nuclear tests, and if so, their results were considered secret and confidential. Nuclear Landscapes. Peter Goin. (Baltimore: Johns Hopkins University Press, 1991) 57 color plates, 35 historical photographs, two essays [Excellence award from Graphic Design USA, December, 1992]. 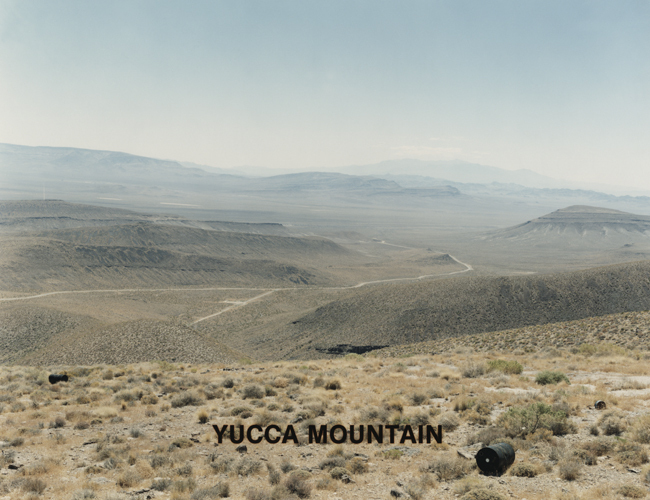 This view of Jackass Flats, bordered by Skull (center) and Little Skull (far right) mountains was taken from the top of Yucca Mountain. 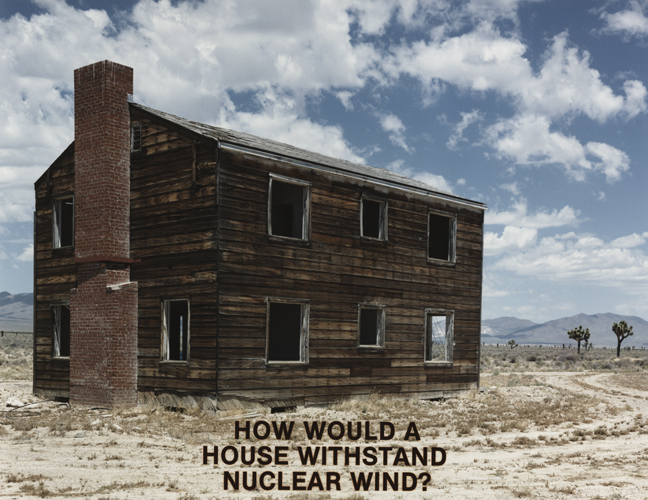 Yucca Mountain is a proposed disposal site for high-level nuclear wastes from across the country. Drilling for a detonation site requires the storage of displaced earth and water. This dry sump pond is no longer in use. The drill site has been preserved for an upcoming test, yet to be determined. The two towers remain from the drilling process. 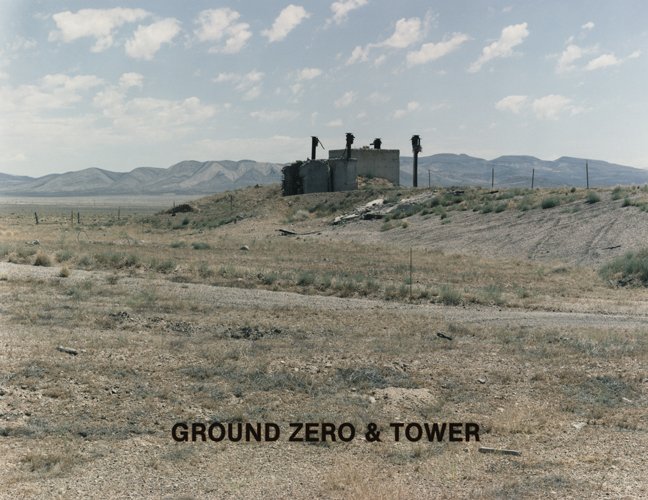 In the above-ground test conducted on this site, the nuclear device was positioned on top of a tall tower for detonation. The great force of the blast caused the tower to disintegrate, leaving only its base. The land in this area is still contaminated with alpha particles, although the surface has been bulldozed. This is the dry playa of Frenchman Lake in Yucca Flat seen from the top of "News Knob," the location of the press gallery during the above-ground testing days. Many of the scientific photographs of mushroom clouds were also taken from this point. Joshua trees once again pepper the desert floor (foreground). 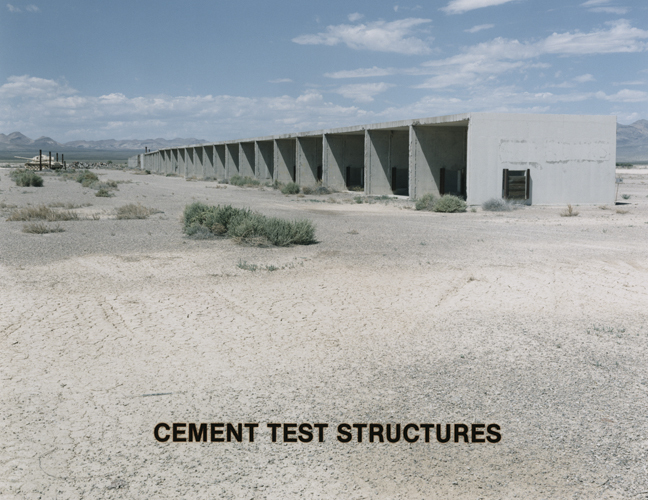 A variety of structures was tested for resistance to nuclear explosions. 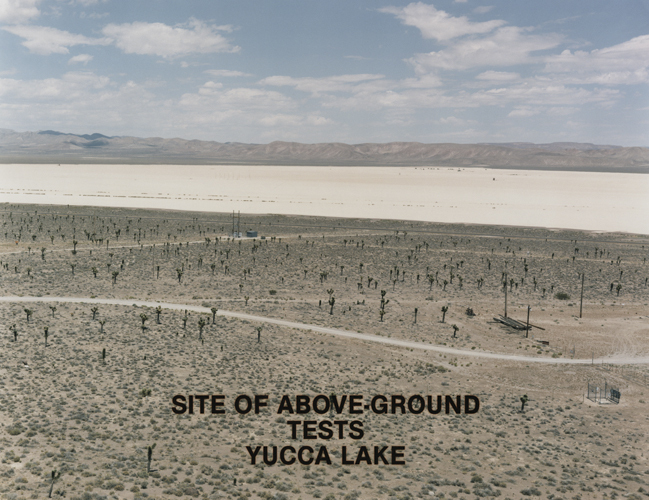 Buildings such as these at Frenchman Lake, Yucca Flat, are located throughout the above-ground testing area at different angles and distances from ground zero. The tank, far left, remains highly radioactive. 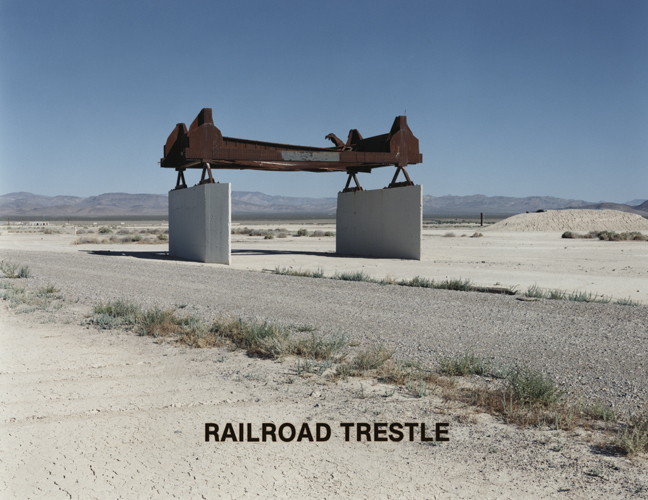 This surviving trial railroad trestle stands in Frenchman Lake, Yucca Flat. This bridge, the only remaining section of an elevated railroad, was located 1,800 feet from ground zero and received overpressures exceeding 450 pounds per square inch. The blast blew sections of the structure off the foundation and bent large I-beam girders. This detonation, code named "Priscilla," had 37 kilotons of force. By comparison, the blast at Hiroshima measured 13 kilotons. 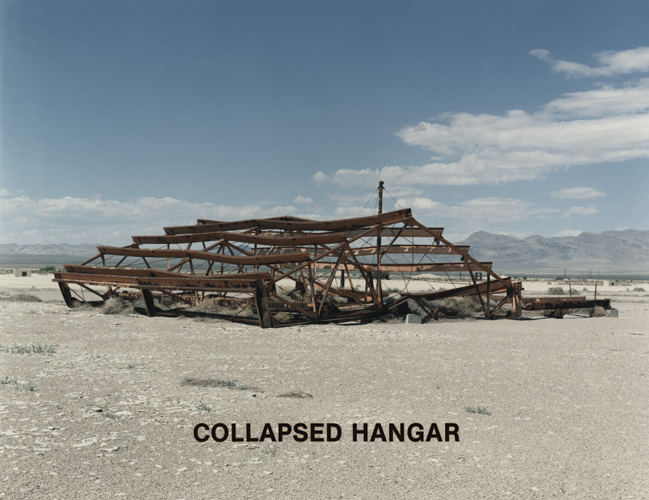 Only the skeleton of this hangar remained after it endured the nuclear winds from a blast at Frenchman Lake, Yucca Flat. 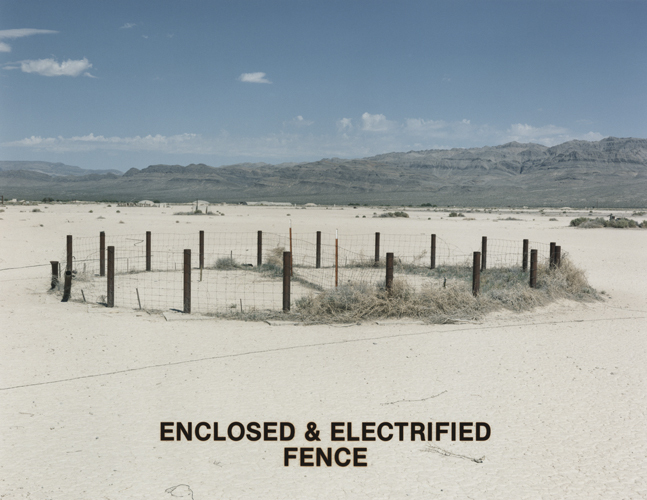 Positioned at different distances from ground zero, enclosures like this one and the one visible beyond it (on the left) contained animal subjects during a variety of tests at Frenchman Lake, Yucca Flat. This building was part of a "doom town," consisting of houses, office buildings, fallout shelters, power systems, communications equipment, a radio broadcasting station, and trailer homes. This house was 7,500 feet from ground zero. In a test called "Apple II," fired on 5 May 1955, the entire foundation shifted from the force of the 29-kiloton blast. The house has been partially restored to document the historical importance of the above-ground testing period. 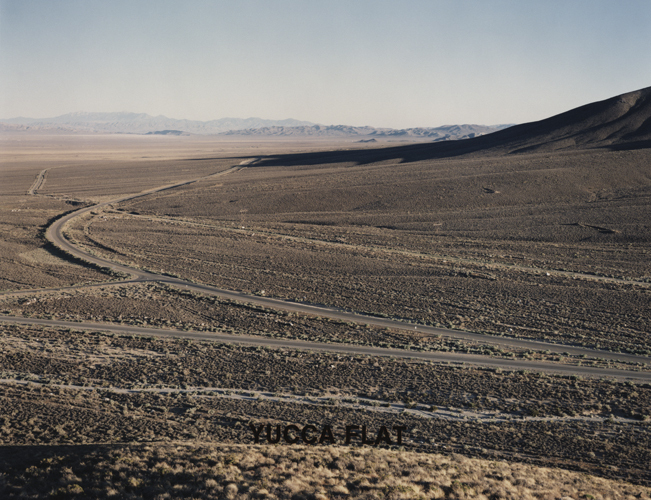 This road was constructed along the northeastern edge of Yucca Flat and used in preparation for an underground nuclear test. A drilling crew then prepared the site for ground zero—right in the middle of the road, about 1,500 feet below the surface. 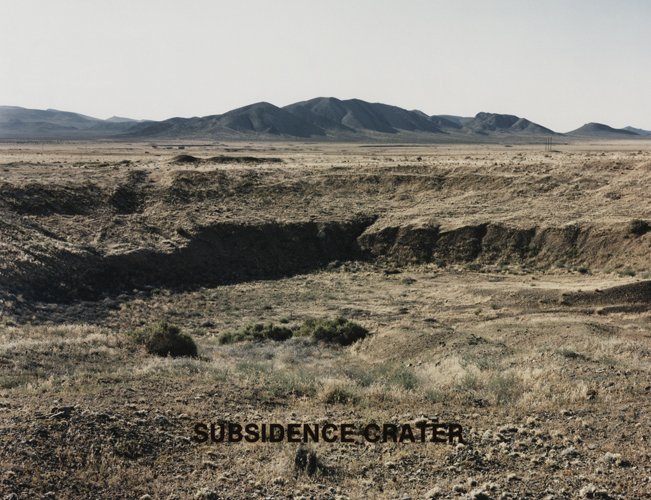 The detonation destroyed the road and created this subsidence crater (the ground collapses into the cavity by the blast). This canyon is in the South Silent Canyon area on the grounds of the Nevada Test Site. 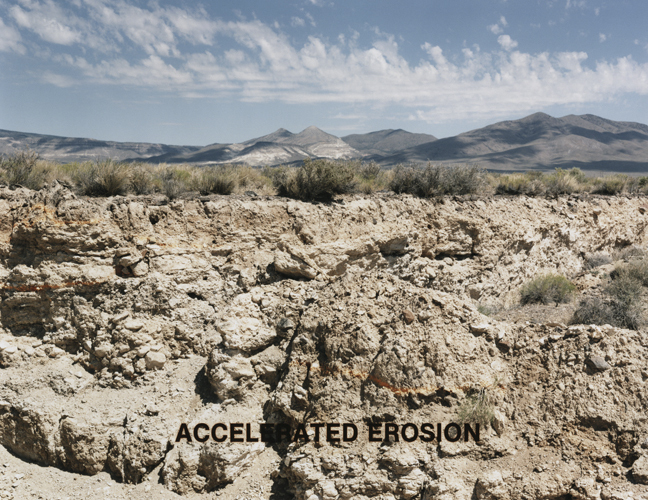 Although the area is not used for testing it demonstrates the accelerated erosion caused by nuclear testing nearby. 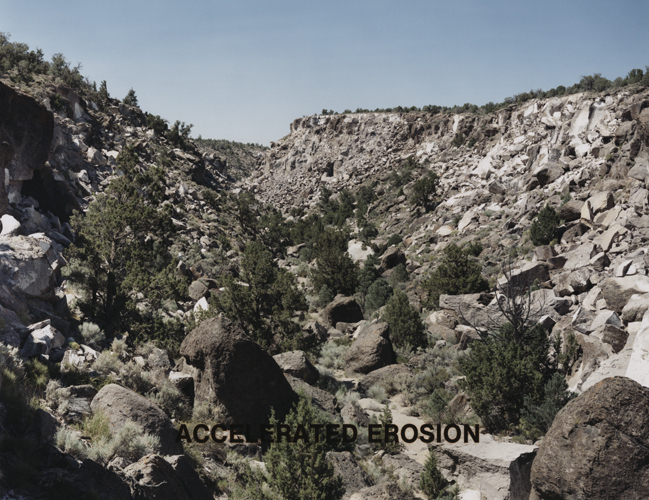 Vibrations from underground testing fracture the rock cliffs, breaking loose huge boulders. The U.S. Geological Survey made a perpendicular cut into a fault zone that runs north to south in the valley floor at Yucca Flat. The orange lines were painted in the dirt to measure the shift of alluvial deposits resulting from nuclear testing. The breaks in the line reflect the degree of the fault shift. A recent underground test was conducted here on Pahute Mesa. Ground Zero was where equipment appears, in the lower left corner of the photograph. Although the surrounding area is composed of rock rather than sediment, and a subsidence crater therefore did not form at the time of the test, geologists cannot guarantee that one will not develop in the future.The large flat area that resembles a baseball diamond was cleared to accommodate numerous trailers containing evaluation equipment. The blast caused accelerated rock erosion in the bluffs visible at middle distance. Since 1963, in accordance with the Limited Test Ban Treaty, all nuclear tests have been conducted underground. This crater resulted from the collapse of earth into the cavity created by an underground nuclear detonation. The test shafts are usually drilled about 1,500 feet deep. 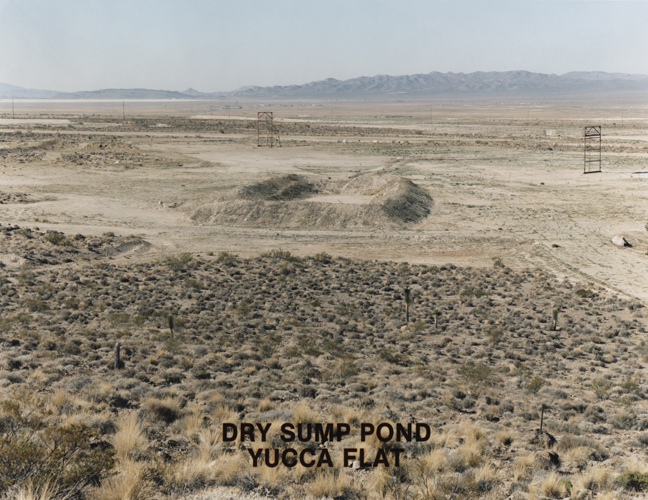 This view at the west end of Yucca Flat shows the shadow of the Eleana Mountain Range along its alluvial plane. 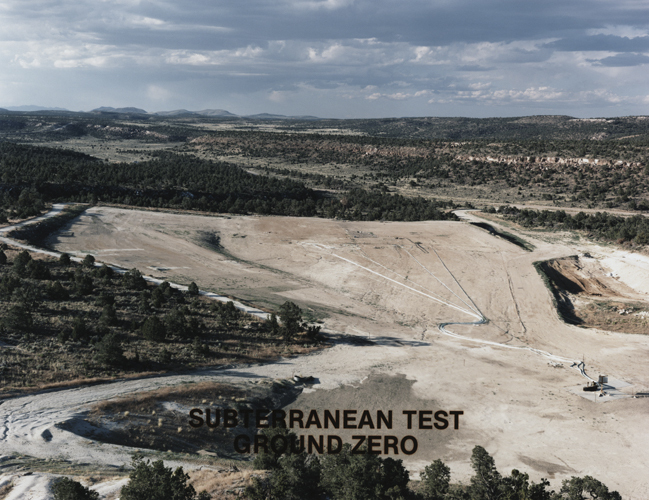 Numerous above-ground tests were conducted in this area. 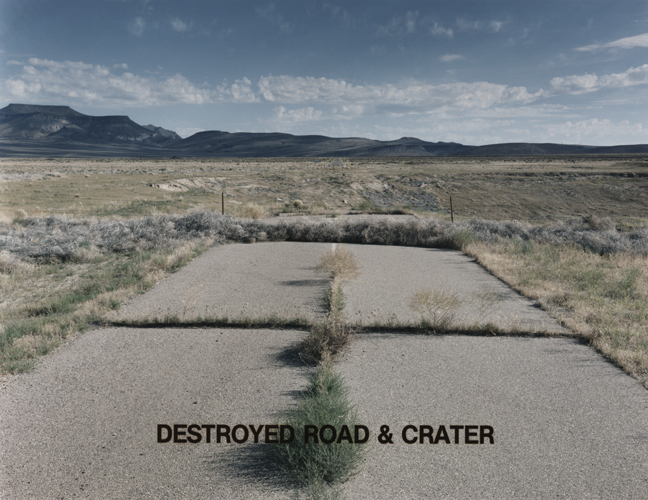 This crater remains from the Plowshares program, the purpose of which was to test the peaceful use of nuclear explosions. The operating hypothesis was that a nuclear explosion could easily excavate a large area, facilitating the building of canals and roads, improving mining techniques, or simply moving a large amount of rock and soil. The intensity and distribution of radiation proved too great, and the program was abandoned. The “Sedan” device was thermonuclear—70 percent fusion, 30 percent fission—with a yield of 100 kilotons. 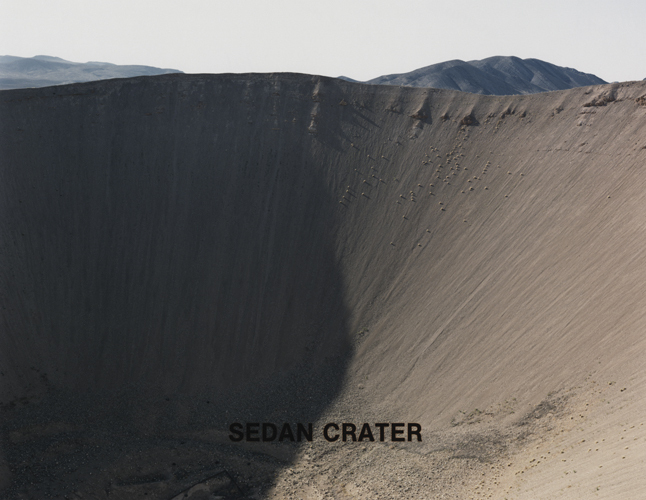 The crater is an impressive 635 feet deep and 1,280 feet wide. The weight of the material lifted was 12 million tons.